When I was a freshman in high-school1, my math teacher showed me this site where you can find a seemingly endless supply of math problems; I loved it. I spent a decent amount of my time solving problems, and a significant amount of my time failing to solve problems, but I enjoyed it either way. 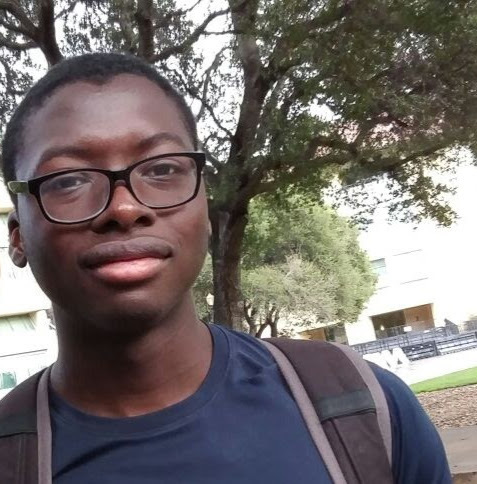 On the site, there are different categories, and you have a level from 1-5 in each category, indicating how well you do at solving those problems. After a while on the site, I came to be level 5 in number theory2, and was pretty shocked. I had barely heard of this “number theory” field, and wasn’t sure what about it made me do well3, so even before I had an idea of what number theory was, it seemed like a interesting field. In general, I feel like number theory is a relatively unknown field to most people, so this is my little part in changing that. This post is probably gonna be a long one. In it, I want to talk about two (hopefully somewhat motivated) problems that lead to some interesting mathematics. Because I want to do the mathematics justice, I will try my best to keep the post self-contained, proving any non-trivial claims I make4. If you are more interested in the results/overall argument than the details, you can skip these. The Greeks seem like as good a place as any to start, and in the context of mathematics, one of the most famous Greeks in Pythagoras with his theorem. I said I would try to prove any non-trivial claim I made, and this theorem has always struck me as non-trivial. However, it is also pretty well known so I’ll just leave you with a picture and a link to the site I stole it from instead5. Now that we have this, this lets us see that we can have a right triangle with side lengths , , , or but not one with side lengths or . In fact, if we think about it, this says we can’t have any equilateral right triangle. If we did and the side length was , then this would give , and a triangle with 0 side length is no triangle at all. I think a natural question to ask at this point would be “what side lengths can we get?”. Now, we have to be careful about how we phrase this, because obviosly given any and , we can find some that gives a right triangle, but that may not be nice. For example, if and , then isn’t the nicest looking solution. What we really want is a triangle where all side lengths are whole numbers. What are the triples of integers where 6 such that ? Worse case scenario, they can be igonored. Squaring erases information about sign, so if you have a negative number in a solution, just negate it to get a solution with only positive numbers. If you have a zero, then you just have , so your solution can be considered “trivial” and just ignored. There’s no harm done here. Working with all integers instead of just the positive integers adds symmetry to the problem. Symmetry and patterns and whatnot are usual good in math, so including them can make finding a solution easier. They have geometric interpretations. If a solution includes , then the right triangle you are describing is actually just a line segment. If it includes negative numbers then your the signs of numbers describe its orientations. You can imagine as a triangle pointing to the right while points to the left. Now that we have a question we’re happy with, how do we actually go about solving it? In my reasons for using all the integers instead of just the positive ones, I said that the whole integers were nicer than the positive integers. While this is true, they still aren’t super nice. When you think about, you can only add, subtract, and multiply integers. You can’t really divide them, so we’ll have to be careful about what algebra we do. With that in mind, let’s see what progress we can make. If you play with this equation for a while, trying to find solutions and seeing what comes up, you might notice a pattern. Looking at the four solutions I gave earlier, we see both and . The second of these is times the first, and this leads into the following observation. What this means is that in our search for integer solutions, we really only need worry about ones where , , and have no common factors. If two of , , and share a common factor , then divides the third one as well. This is a start. From now on, we’ll implicitly assume the numbers we’re working with are coprime7. Returning to our issue with integers, we can’t divide them, but we know that if we do we’ll get a rational number, and fractions are even nicer then integers. This leads to the following simple yet profound algebraic manipulation. When we do this, and are fractions in simplest form since this goes both ways, this means that finding (coprime) integer solutions to is equivalent to finding rational solutions to ! It get’s even better than this. The rational satisfying are exactly the rational points on the unit circle. Pf: Pick any point \((x,y)\) on the unit circle. Draw a right triangle with points at \((0,0)\), \((0,x)\) and \((x,y)\). A moment's reflection will reveal that this triangle has the line segment from the origin to \((x,y)\) as its hypotenuse (which is length 1 by assumption), and that its width and height are \(x\) and \(y\) units long, respectively. Thus, by Pythagoras' Theorem, we have \(x^2+y^2=1\). Thus, the points on the unit circle are those satisfying \(x^2+y^2=1\) and from this we see that claim holds. 8Stop and think about this for a second. We have shown that the number theoretic problem finding all integer solutions to is equivalent to the geometric problem of finding all rational points on the unit circle. This is a major shift in perspective and will directly lead into the insight that allows us to answer our question. When giving a mathematical argument on here, I’m always a little stumped on how to motivate to main idea. I would like to give the impression that there’s nothing magical or other worldly going on here; that given enought time to think about it, you could have produced everything I do here. What follows is my best attempt to do that. To describe this mathematically, we need to decide how we’ll uncurl the circle. We want to manipulate the circle until it lies along the number line, but there are many ways to draw a line in the plane, so we need to choose one. Any will work, but following the animation’s example, we’ll use the line . Now, we need a choice of reference point, where we’ll begin our uncurling. You can imagine that if we unzipped the circle from the point then of it would end up below the -axis and only would end up above the -axis. Because we like to keep things simple and symmetric, we’ll unzip from the point . 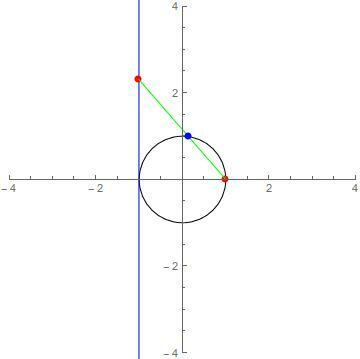 The line where is rational intersects the circle in two rational points. At this point, we could follow the proof and use the quadratic formula, but I’d rather introduce something new called Vieta’s formulas. If the polynomial has roots , then . This seems like another good place for a quick pause. What we have just done is found a way to turn a rational number into a pair of rational numbers on the unit circle which can be turned into 3 coprime integers that satisfy the Pythagorean theorem. In essence, we have found a 1-1 correspondence between fractions and rational points on the circle 10 which solves our problem by our earlier observation that rational points on the circle are in 1-1 correspondence with coprime Pythagorean triples. All Pythagorean triples can be generated this way with the caveat that you may have to swap and , negate one (or both) of them, or scale both of them up by a constant factor. There is a nice connection between the second thing I wanted to talk about and the first, but unfortunately, I cannot remember it so I don’t have a good segway into this topic like I wanted to. 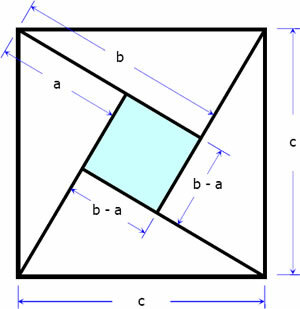 I will still mention that one of my favorite identites from algebra was always different of squares: , and in fact, if you look at the Pythagorean problem, it was essentially a fancy difference of squares problem. We had which just means that . The issue with factoring this like before is having to take a square root of . This isn’t a big issue though. You can extend the real numbers to a bigger set of numbers called complex numbers that includes a number such that . Allowing for use of , we can write as . In fact12, you can use this to derive a formula for all Pythagorean triples instead of taking the approach we did above. If nothing else, that should be indication that this is something worth studying. The primes that can be factored seem pretty random, but the way in which they are factored has a pattern to it. When I introduced , I said that which means that is a square root of . However, every number has two square roots, and indeed , so is no exception. However, when I defined , I just said it was a square root of without specifying which. You can imagine swapping with everywhere you use it, and this shouldn’t change whether what you have is true or not since ’s defining feature (having as a square) doesn’t define it uniquely. This could make you think that there might be ways of combining and to gain information about numbers. Given a number , we define its norm to be . Note that the norm of a number is always a non-negative integer. A number that divides is called a unit. Equivalently, if there exists a number such that , then is a unit. Pf: \(uv=1\implies N(uv)=N(u)N(v)=N(1)=1\implies N(u),N(v)=1\). Conversely, the statement \(N(u)=1\) itself says that \(u\) is a unit (why?). (Normal) prime factors in if and only if can be written as the sum of two squares. Pf: \((\rightarrow)\) Assume \(p=\alpha\beta\) factors in \(\mathbb Z[i]\) with \(\alpha,\beta\in\mathbb Z[i]\) both non-units. Then, \(p^2=N(p)=N(\alpha\beta)=N(\alpha)N(\beta)\). Since \(N(\alpha),N(\beta)\neq1\) by assumption, this means \(N(\alpha)=p\). Write \(\alpha=a+bi\) to get the result. This means we can classify the normal primes that are Gaussian primes by figuring out which can be written as the sum of two squares. This turns out to have a surprising answer using some modular arithmetic. An odd prime can be written as the sum of two squares only if . We would like to prove the other direction, that if , then its the sum of two squares. While this turns out to be true, it doesn’t have as simple of a proof 13. First, note that if we have a a number s.t. for some , then we know that divides which looks like a step in the right direction. This motivates the following theorem. If prime , then . Show that the converse of this lemma holds as well. If for odd prime , then . Now that we’ve taken that step, we can finally proof the other direction of our previous theorem 14. An odd prime can be written as the sum of two squares if . Extend the work done here to show that an integer can be written as the sum of two squares if and only if every prime that divides it does so evenly many times. As an example, we can write , but we cannot write as the sum of two squares no matter how hard we try. The second half of this post did not turn out as well as I had hoped it would have. I probably should have thought through the order I would cover steps of the proof, and decided some minimum level of mathematically knowledge that I would assume before writing it in order to avoid it sound like a poorly motivated mess16. But oh well, too late now.